Seid - "Meet the Spaceman"
This is the third 7" release in 2 years by the excellent Space Rock band SEID from Trondheim in Norway. The band has recently recorded a new studio album due out in the spring this year and this is one of the tracks. The band has also made a very humorous and fun to watch video for the title track. "Meet the Spaceman" is a really great brogan based space rock adventure with a high energy and GONG like quirkiness. The midsection is really rocky and spaced out before the guitar solo bursts in and we are back to the catchy vocal line. Great track. The b-side, "Do As You're Told" is a complex, building space rock jam track with distorted vocals and a great cosmic wah battle with the organ and guitars. Limited to 200 (I Think) and on red vinyl. A sure collectors item! 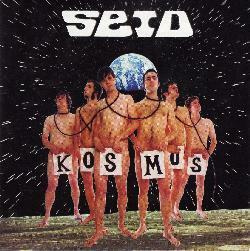 For more information you can visit the Seid web site at: http://www.kosmonautes.com.